Located in Frankfort, Michigan, Serendipity House offers four-season lodging in 5 suites at the water's edge. Pack your beach gear and turn right to enjoy Lake Michigan's beaches and spectacular sunsets. Cross the street to start biking the 26-mile Betsie Trail. Or turn left to enjoy downtown Frankfort's unique shops and restaurants. Then come back for fall colors. winter skiing, and spring awakenings. With five suites, we're especially well-suited for wedding parties, family reunions, or for sharing vacations with friends. Special weekly and off-season rates. We're listing the Lakeview Suite, but if the dates you'd like are not available, please go to one of our other suites: Betsie (HomeAway #195186); Manitou (HomeAway #180215); Nannybird (HomeAway #186194); or Sandune (#185719). Come stay with us soon! The Bannisters got into innkeeping accidentally, when Tim's stepfather surprised his mother with the purchase of a resort with 12 cottages and a motel in nearby Arcadia. It was a long, colorful and rocky road until the resort was sold off in 2007, but Tim learned a great deal as an innkeeper and decided to build off that experience. Pierside Lodging had been a bed-and-breakfast that had been closed and mothballed for 4 years when Tim purchased the property and renamed it 'Serendipity House.' Built in 1890, the house had started out as an inn, going back to hosting the workers who built the Frankfort Pier. Today, Serendipity House is a one-of-a-kind inn designed for vacationers who want a unique experience that includes their accommodations. 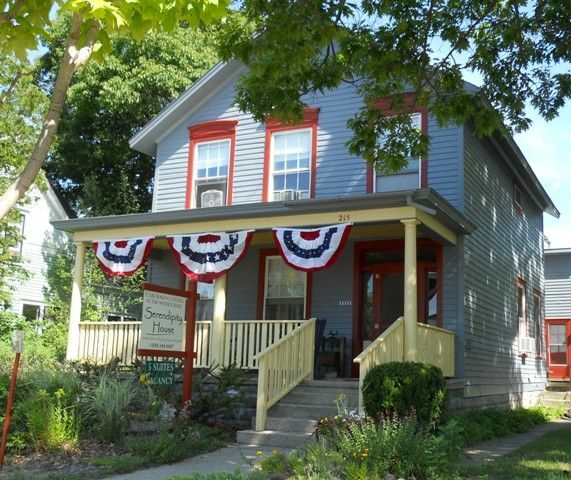 Situated on Main Street a block from Lake Michigan and at the edge of Frankfort's charming downtown district, the inn recalls earlier times when residents would call out greetings and exchange gossip from their big front porch to passersby. Serendipity has the big front porch and updated living space with all the amenities for vacationers who enjoy something unique. Located at the front of Serendipity House, Lakeview offers views of the Betsie Bay across Main Street and of Lake Michigan to the west. Located on the second floor of Serendipity House, Lakeview has a lovely view of Betsie Bay across the street. Yep. We furnish high-quality linens and towel sets, all paper products, and coffee, tea and popcorn. All you need to bring sre your personal bath items. Yep. We furnish high-quality linens and towel sets, all paper products, and coffee, tea and popcorn. All you need to bring are your personal bath items. Lakeview's kitchen has been updated and expanded to make it more convenient for vacationers who enjoy cooking during their stay. We offer cable from May to October. During the remainder of the year, we have a host of books andvDVDs on hand when the weather drives you indoors. Serendipity/Lakeview has a second-floor deck just off the private bedroom. Just down Main Street, you can rent kayaks or canoes from the Surf Shop to explore the nearby Betsie and Platte Rivers. Serendipity/Lakeview has its own exterior door off the bedroom that opens out onto a second-floor deck with a view of the Betsie Bay across the street. We're 15 minutes away from several challenging public courses, including the internationally renowned Arcadia Bluffs. Location, location, location! We are a half-block from the start of the 22-mile Betsie Valley Bike Trail; one block from the start of miles of Lake Michigan beach; one block from the restored Garden Theatre and our very own Storm Cloud Brewery; and two blocks from the start of Frankfort’s unique shops and restaurants. We had so much fun in Frankfort staying at the Serendipity House! The location is perfect, right near our favorite places to eat, The Coho and Stormcloud microbrewery and just a 1-minute walk to the beach! The rooms were spotlessly clean, owners were friendly and easy and the beds were comfy!!! We loved it and will always stay at Serendipity if we can! Thank you for your nice comments, we enjoyed having you and you’re welcome anytime! Beautiful home and great lication! Gorgeous grpunds, loved the fire pit and beautiful flowers on the front porch. Steps from the beach, lighthouse & sunset! Wonderful place! The owner, Tim, was great and the unit had everything we needed. Clean and close to everything. The lake was just a block away and shops and restaurants were in walking distance. Great brewery with tasty pub food selections, just a few blocks away. Wonderful experience. We stayed because it was a short drive to Arcadia Bluffs golf course. We should hire them to produce our next brochure! The review captures everything that makes us a great choice for a Northwest Michigan vacation getaway. And we're open year-'round. We stayed in the Lakeview Suite for three nights. We had two adults, a five year old and a baby. Some of the decor has been updated from the pictures shown. Location: Excellent. 1 block to beautiful beach, go the other way for shopping and restaurants. Can even walk to grocery store (>1mile) if needed. Tiny view of lake Betsy though the windows, best view is from the toilet - not kidding. Space: good space for two adults plus pack-n-play (provided by Serendipity house) in the bedroom, especially if you block off the internal entry door and just use the external door as we did. May not be so pleasant in the winter. Living space had a sleeper sofa, but it takes up all available room so we used a small inflatable bed (we brought our own) for our 5yo and then propped it in the corner so we had living space during the day. Bathroom is ample, though shower is small. Amenities: Kitchenette had all appliance, pots, pans, etc. Including dish soap. Need to bring your own salt pepper and other condiments. Bathroom had plenty of towels though some were slightly stained (not gross - just showing wear). No shampoo or shower soaps provided. Enough space and hooks for storage of clothing, gear, and food supplies. Clothesline in back for drying suits was very helpful. We didn't use the picnic table, backyard chairs, or fire pit, but they were all there. "Grill" is a tiny webber charcoal camp grill. Will do the trick if you're desperate, but too fussy for our needs. Peaceful backyard setting with just other home noise, not business noise. Nice front porch to people watch or read. Beach chairs provided in the bedroom. Owner appeared to be working in grounds and doing other maintenance while we were there - I took that as a good sign. Good service interactions. Cleanliness: Average. This is the one that will keep me from letting my mom stay here. Carpets were worn and had stains and there were stains on the couch. We found earrings in the floor when we arrived which made me question the vacuum job. Linens were clean, but bedcover did not appear to be made of a washable material. Perhaps they switch them out and get them laundered - otherwise... Dust on pictures and flat surfaces, sand in drawers. Looks like they weren't wiped out between guests. Kitchen was clean as was the bathroom. Honestly, I think it just might be too much for one housekeeper to handle during peak season. Nothing gross - just not as nice as it could have been. We have stayed at Serendipity House several times since it opened and have always found it to be charming and very centrally located. Each time we've visited we've seen a constant improvement in upkeep and renovations. Very laid back atmosphere with an inviting front porch where we have met other guests from Germany, Washington State and Japan. We've never looked for a hotel when staying in Frankfort and this fits the bill. 2 blocks from the beach and 1 block to town. The rooms are well kept and clean. Bathrooms are stocked with towels and chairs are provided for the beach. It's nice to be able to take our dog with us and have never had a problem with noise. Located in Benzie County on Michigan's famed West Coast, historic Frankfort was noteworthy in the 1800s as a lumber, shipping and railroad town, as well as a summer getaway for tourists. Today, it continues to be a popular destination for vacationers. It has acquired a reputation for great fishing and as an outdoor person's dream with hiking and bike trails, as well as swimming, sightseeing, fall color touring, and winter sports. Sleeping Bear Sand Dunes National Park; extensive trail systems; and the Interlochen Academy, home to music and cultural festivals, add to a rich palate of activities. Reservations made with less than 30 days to arrival are paid in full. Holidays and adjacent days are charged at the weekend rate. Guests will receive 100% of their paid rental costs, if they cancel up to 60 days before the start of their reservation. Guests will receive 50% refund of their paid rental costs, if they cancel up to 14 days before the start of their reservation.